This week we will play the Minuet. 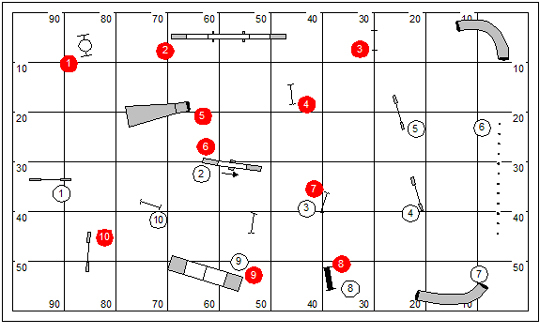 On the surface, the Minuet is a simple game with a straight-forward sequence repeated over and over again. In fact, the game will expose every flaw in movement the handler might have as the handler must also repeat his movement over and over again. There will be dropped bars, refusals and even off courses. This game demonstrates a simple principal. Most performance faults are the fault of the handler and not of the dog. 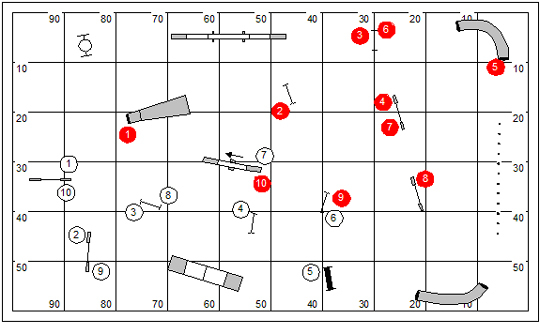 Following the briefing and description of the game I intend to write an educational bit to TDAA judges who are assigned the mission to design a minuet for competition. The dog and handler have 50 seconds. Repeat the sequence as a continuous loop until the expiration of time. The judge may specify that the dog has to cross a finish line or go to a table to stop time after the whistle blows to end scoring. One point is earned for each completion of the loop. One decimal point is earned for each jump in an uncompleted loop when time expires. 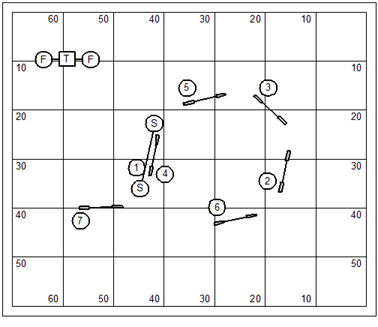 For example: In 50 seconds, the dog does 7 complete loops and the first two jumps in the sequence. The dog’s score shall be 7.2. If the dog drops a bar, the handler must stop and reset the bar. If the dog goes off course, one point is lost. Counting of the loop will not continue until the dog returns to the next on-course jump. 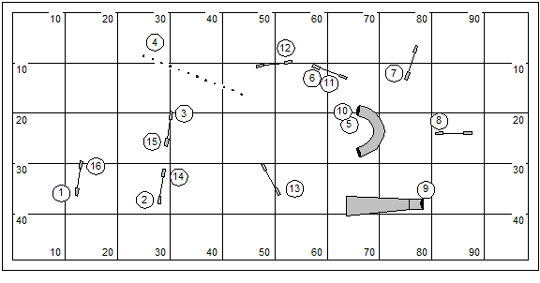 In a game, like this, with a finite number of possible scores the time to the table will often determine placement. When the 50 second whistle blows, you should head for the table without hesitation. What you should immediately understand about the Minuet is that it is a small sequence with a feature technical challenge. TDAA judges often struggle with setting appropriate qualifying criteria for the game. 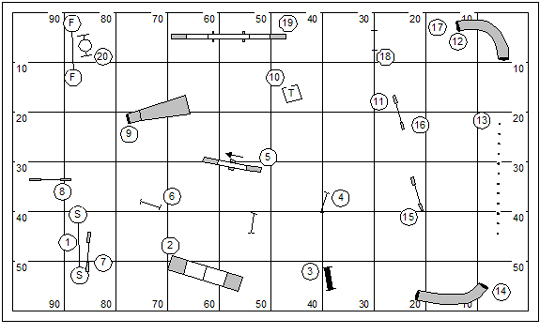 The qualifying criteria should reflect an appropriate rate of travel for the level and jump height of the dog. The only way to do this is to measure the sequence. We have here a measured path (courtesy of the Clean Run Course Designer) that has the dog’s path at about 55 yards. 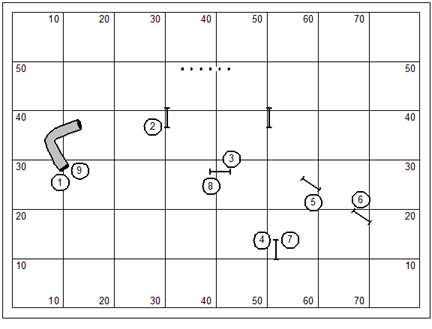 Note that I took the table out as the end of sequence obstacle, because all real scoring takes place in the repetition of the basic sequence, which flows from jump #7 right back into jump #1. What I got immediately from this table is that the Games III dogs should be about to do two complete circuits in 50 seconds. Lord knows that if a dog makes an error in the Minuet he’ll really deserve the Q of he picks himself up and still finishes in time. The fourth column is a weighted percentage based on the rates of travel by level and jump height. So in the fifth column I’ve extrapolated how many obstacles in the sequence the dog should be able to complete. This would have been considerably more complicated if the sequence featured technical obstacles. You guessed it: this week’s game is based on the Letter G, right out of Nancy Gyes’ Alphabet Drills. The workbook and disk with all the drills in CRCD format are available at www.cleanrun.com. 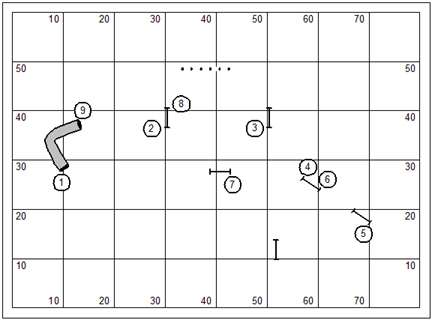 This is exercise #17… though jump #7 was added to close the loop to make it a Minuet. Note that the transition from #7 through jump #1 creates a complication that was not included in the handling discussion in Nancy’s workbook. 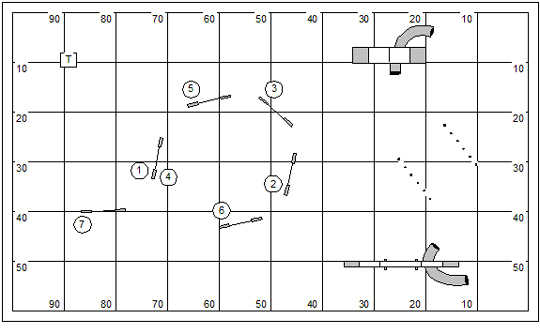 This week’s league play featured a standard course, illustrated below. Dogs registered with the TDAA are eligible to earn a qualifying score for titling. Dogs will be judged using the rules for performance respective to their level. A clean run is required to qualify. Performance on the table is handler’s choice. Plus 5 seconds for the performance of the table. The standard course times seem like a real give-away. However, we’re using the rates of travel from the TDAA (on the high end of the range). 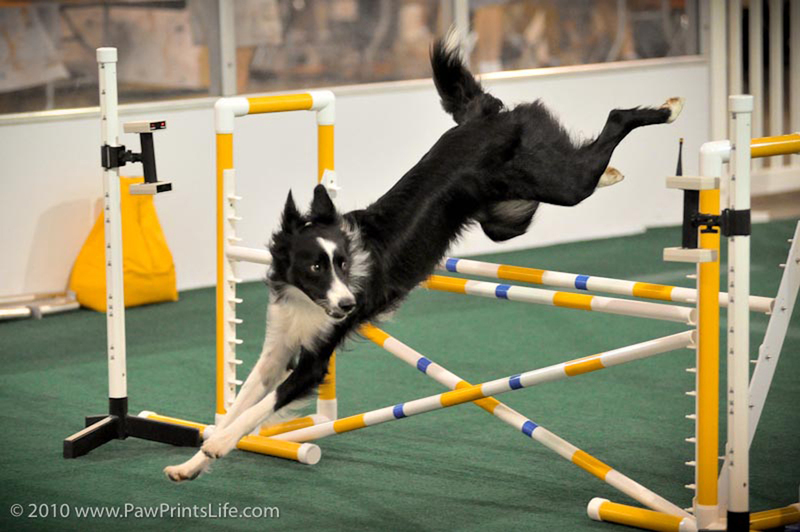 Because of the big-dog spacing between obstacles dogs manage to raise their YPS; and it is not so degraded by the contact obstacles and weave poles as in the tighter-spaced TDAA courses. I borrowed the course concept from a course I was reviewing from the TDAA. This is something for the TDAA’s course design college (a regular theme in my blog). The purpose of the entries for the course design college is to make a training point with as many of our judges as will pay attention all at the same time so I don’t have to keep making the instruction over and over again, one judge at a time. I wrote these directly to the judges on whose courses the tutorials were based. It was easier to illustrate my teaching point than to try to talk or write my way through them. This has been about my longest hiatus from writing to my blog since I started keeping it. I know that after the loss of our boy Tempest it might seem that I was gloomy and in despair. The truth of the matter is that I’ve been working on our taxes; which is a very complicated matter this year. It’s an annual ritual that retires me to my cave reading over small bits of fading paper. I do want to say that there was quite an outpouring through Facebook as responses to my blog and personal messages to offer condolences. I have to confess that I did find considerable comfort in the kind wishes and words that came our way. Thank you everyone who sent a note. The thing about dog-people, those of us who fill the corners of our lives with dogs… is that we all understand the life and the death of a dog, both in real and practical terms and in terms of the personal triumphs and tragedies that attend. Every one of us knows that grief. Oh by the way, I’ve been neglecting a lot of stuff as I work on taxes. My email in basket is taking about 50 hits a day and I know I’ll be several weeks digging my way back out. If by any chance I owe you a return reply… please bear with. I’ve been obsessing a little bit on training sequences from around the world. I got this bit from a website in Argentina, Criadero Canino Sweetness Dreams. You’ll have to bear with me a moment. We lost our boy Tempest yesterday after a cluster of epileptic seizures. He wasn’t two years old yet. The epilepsy showed itself only two months ago. But it feels like it’s been a year. Our lives have been turned upside down. The name of the agility group down in Argentina struck me this morning and reminded me immediately of a James Taylor song, where he sings “sweet dreams and flying machines in pieces on the ground”. I went out and looked for it on YouTube and had a good cry for our sweet lost boy. As absurd as it sounds, in the first week of February, we got an opportunity to work our dogs in the lower field. I had an early private lesson (Katie & Dave). They schlepped most of the jumps down to the field; so I set up some interesting handling sequences for them. Afterwards of course I had to put my boy on these sequences. 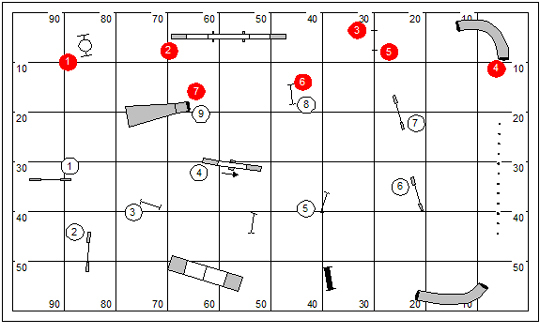 The challenge in this sequence was being forward of the dog on the approach to jump #7 to get on the turning side and give a pre-cue signal to tighten the turn from jump #7 into the weave poles. I’m not trying to say that this was the only way to handle it… the handler could certainly do a Rear Cross at jump 7, but with considerable more risk and likely a less efficient turn. The key to this strategy was to do a bit of distance work. 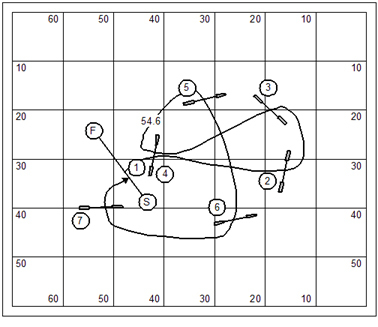 I show in this drawing the handler giving just enough pressure to get the dog out for jumps #4 and #5 and then fading back between jumps #6 and #7 to fold backwards in a Front Cross that resolves to the turning pre-cue. Frankly if the dog is really fast the handler may want to layer to the opposite side of jump #1. Though that strategy certainly has a bit of risk. 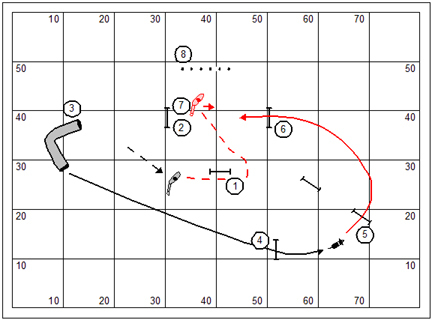 As it turns out the real challenge in this sequence is in the transition between jumps #7 and #8. 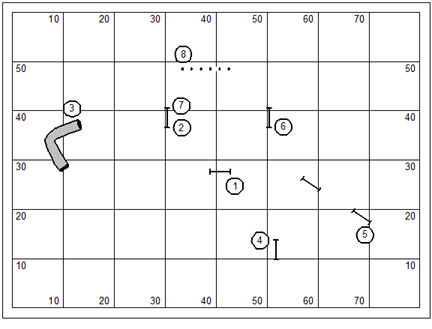 The dog’s turn between jumps #6 and #7 is bound to be efficient enough that it creates a line of approach after jump #7 that gives jump #8 a miss. Dog on right at jump #7 is most likely to create the refusal. 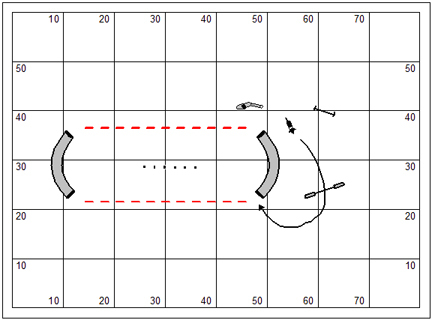 Dog on left will draw the dog into the approach to jump #8, leaving the Rear Cross as the finishing movement. This is a bit more technical than what we’ve done so far. The transition between jumps #4 and #5 is very nearly a threadle. 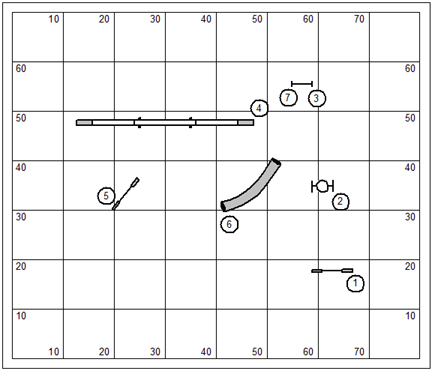 After managing this technical bit in the sequence the handler really needs to get down to jump #8 with dog-on-right to draw the dog tight for the turn to the pipe tunnel at #9. 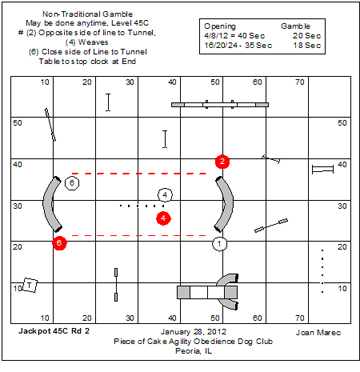 Somebody sent me the following course, a non-traditional CPE Gamble course. Apparently the course skunked (nearly?) the field. What the judge required was for the handler to put the dog into the pipe tunnel entry opposite the side he (the handler) was working. The person who sent me the course said that it was very hard to send the dog across the face of the tunnel to get into the far end. I imagine that is so. I looked at the problem more like this… there’s a real opportunity to send the dog out around to the back-side of the tunnel and call him back through. 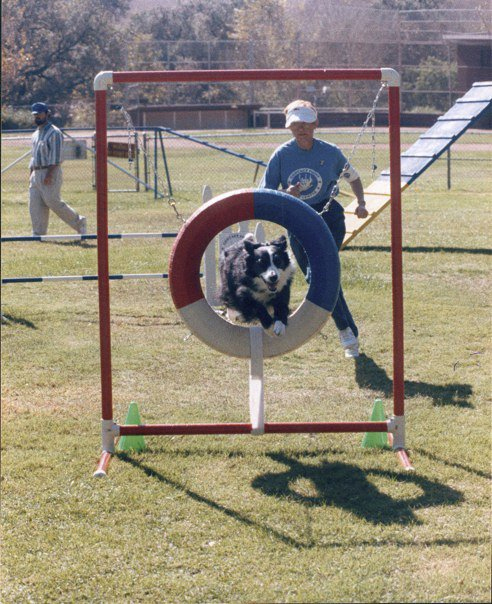 If the handler can get that bit done it will be hard enough convincing the dog to get away coming out of the tunnel to make an orderly approach to the weave poles… so the handler will have to back up a step or two to bend the dog sharply as he makes his exit from the tunnel. There’s only about 16′ of real estate (in a straight line) to work with. I find it interesting that the spacing guidelines observed in a standard class aren’t necessarily accommodated in a distance challenge. But that’s the way it goes sometimes. I have a number of fun events on the calendar. Thought I’d give a shout out for a seminar I’m doing for Ohio Airdogs in North Royalton, OH on April 21 and 22. That’s up around Cleveland, I believe. I heard there’s a rumor in the area that I’m a small dog handler. That’s funny. I guess I’ll have to bring Kory, my leggy 22″ BC boy up there with me. I’m looking forward to it. You are currently browsing the Bud Houston's Blog blog archives for February, 2012.